Got a success story of your own? 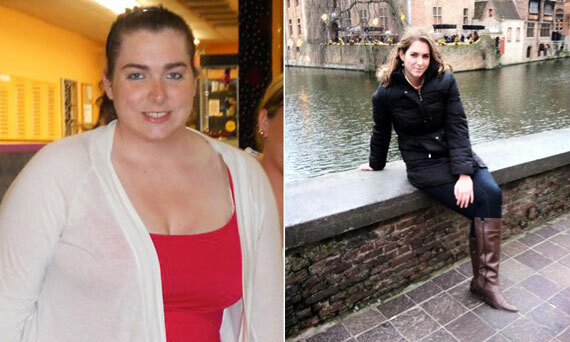 Send it to us at success.stories@huffingtonpost.com and you could be featured in our I Lost Weight series! How I Gained It: I started to struggle with my weight in high school, although I was never more than 10 or 15 pounds overweight. My weight escalated much more rapidly during my first two years of college. I used food as a way to handle stress. It would make the stress go away quickly, and the effects would last long enough to get whatever it was off my mind. I kept burying every negative feeling I had with food rather than actually dealing with it. While I exercised a moderate amount, it didn't make up for taking full advantage of an all-you-can-eat dining hall, late night study snacks and weekend festivities. Breaking Point: I was able to get an on-campus apartment for my junior year, making me feel like I had much more freedom and control. I avoided weighing myself for months but finally decided to rip the Band-Aid off and face the facts shortly before classes started. Once I saw my weight I could not hide from it anymore. Weighing myself was an expression of accepting the situation for what it was and committing to changing it for the better. An extra push was that I majored in health sciences. I didn't want to make a career out of health and not make healthy choices in my own life. How I Lost It: I exercised about five times a week, incorporating both strength and cardio. Taking fitness classes helped me stay accountable, since I never made excuses or skipped workouts those days. This prevented me from getting into a rut where suddenly I hadn't been to the gym in a month. Running was one of the few physical activities that I used to dislike, but now running outside in nice weather is one of my favorite activities. Calories were not my focus, but keeping track of them was helpful at first to get a better understanding of what an appropriate portion looked like. While losing weight I ate about 1,700 calories a day, but I would usually go over on the weekends. I eat a balanced diet full of healthy and natural ingredients. I don't believe in choosing between eating for health and eating for pleasure. I love food; eating a repetitive, micromanaged diet of food I don't like is not an option for me. Every time I go grocery shopping I buy something healthy that I haven't tried before. Healthy cooking has become a creative outlet for me. Whenever I want to eat something unhealthy, I nutritionally upgrade it in a way that still tastes great. I never let weight loss take over my life; I made sure that I still had fun. I ate small amounts of dark chocolate on a daily basis. I allowed myself to occasionally have some junk food or moderate amounts of alcohol when I went out with friends. I did not allow weight loss to feel like a punishment, because I am not very good at sticking to things that make me unhappy. I tried following all the "rules" countless times, and it repeatedly fell apart after a couple of weeks. While I had a goal weight, I approached it as a lifestyle change. This approach kept things in perspective when I made mistakes or inevitably didn't always get the results I expected. I've used my Tumblr account to share my thoughts on fitness and weight loss and as a source of inspiration. I think social media has been great for connecting with other people on similar journeys. Having a positive mindset was one of the most important aspects of my weight loss strategy. When you change your behaviors out of love rather than shame, it is much easier to continue making healthy changes and feel good about yourself in the process.